SACRAMENTO, Calif. (BRAIN) — The North American Handmade Bicycle Show, which closed Sunday, notched a record number of exhibitors for the 15-year-old event: about 210. SACRAMENTO, Calif. (BRAIN) — "Officina" Dario Pegoretti, the team of builders that Dario Pegoretti trained for many years — will exhibit at the 2019 North American Handmade Bicycle Show. 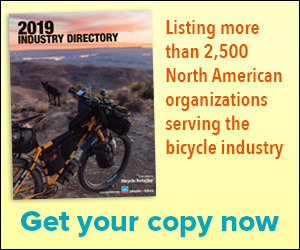 SACRAMENTO, Calif. (BRAIN) —Registration is now open for exhibitors/builders for next year's North American Handmade Bicycle Show, which will held at the Sacramento Convention Center from March 15-17, 2019. HARTFORD, Ct. (BRAIN) — The North American Handmade Bicycle Show this year has opened up voting for the People's Choice Award to everyone. Bike enthusiasts can vote for their favorite bike displayed at NAHBS online. The bike with the most votes will be named the official winner. Next show is back to Sacramento. HARTFORD, Conn. (BRAIN) — Despite a bit of snow on Saturday evening, the North American Handmade Bicycle Show enjoyed one of its most successful weekends in the event’s 14-year history, its first-ever visit to New England. HARTFORD, Conn. (BRAIN) — Organizers of the North American Handmade Bicycle Show have opened up new exhibitor registration for next year's show, which will be Feb. 16-18 in Hartford. SALT LAKE CITY, Utah (BRAIN) — It’s been called the epicenter of bike innovation. And as you walk the aisles of the North American Handmade Bicycle Show, it’s easy to see why. From radical to subtle, the artistry is wide-ranging. SALT LAKE CITY, Utah (BRAIN) — Tracking down Don Walker for an interview was no easy task. As the show has grown, he’s got more to keep on top of.